Dawn and I have been friends for years, and we get together as often as we can to have our own personal Craft Day. We live in far flung parts of the Commonwealth so it is common to alternate houses for our get togethers. Last month Dawn came over to my place with the most amazing project: she was crocheting plastic. 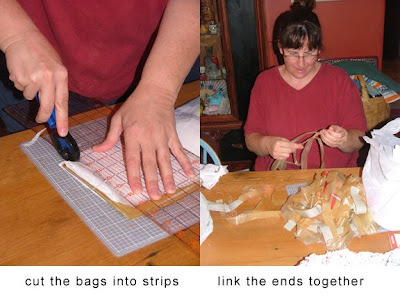 I was so blown away by Dawn's ingenuity and skill at this project that I just had to share it with you. 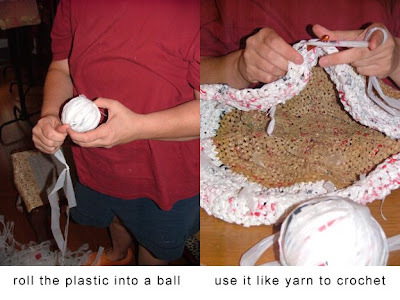 What a great way to reuse plastic bags! 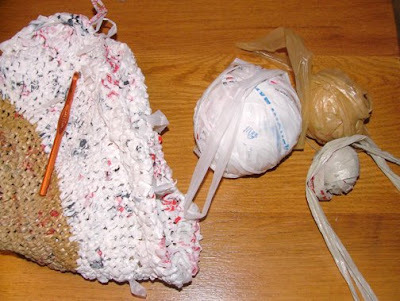 Dawn is using these used plastic shopping bags to crochet a super strong giant market bag by cutting them into strips, linking all the strips together into a big ball of yarn - I mean plastic - and then she gets to work making loops with her crochet hook. Genius. You can see Dawn's work on her web site, blog, and in her Etsy shop.